The BJP on Sunday said a firecracker factory where a major fire broke out on Saturday leaving 17 dead secured a licence from the Delhi government. NEW DELHI: The BJP on Sunday said a firecracker factory where a major fire broke out on Saturday leaving 17 dead secured a licence from the Delhi government. "This place, this factory, its licence and everything was with the Delhi government and its industry department. It was being run illegally," Delhi Bharatiya Janata Party (BJP) President Manoj Tiwari tweeted. Echoing him, North Delhi Mayor Preeti Agarwal said: "Bawana Industrial Area is under DSIIDC (Delhi State Industrial and Infrastructure Development Corp) and land allotment has been done by the Delhi government." Earlier, the Delhi BJP attacked Chief Minister Arvind Kejriwal after he retweeted a video of Agarwal where she is seen cautioning officials not to say anything against the fire that took place in Delhi's Bawana Industrial Area. Kejriwal on Saturday night retweeted a video where Agarwal is heard saying: "The licence of this factory is with us. That's why we cannot speak on the issue." Tiwari then took to twitter: "What can be more shameful than this, where 17 people have lost their life and the Chief Minister is retweeting a false video." 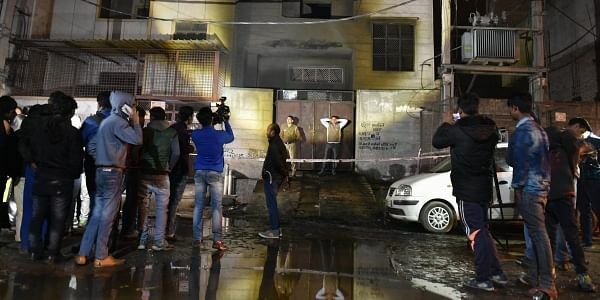 As many as 17 people, including 10 women, were burnt to death or asphyxiated and 30 others injured in a fire in a plastic warehouse which was also used as a godown to store firecrackers in west Delhi's Bawana area. The owner of the factory has been arrested.